State it. Shape it. Share it. The ultimate tool for personality-driven brands ready to make waves (and make money) writing, saying, and spreading the stuff that matters. Crack through the the snooze-worthy haze of digital content you’ve seen a billion times, and make stuff that feels true to YOUR distinct point of view. Create a social presence your customers get obsessed with — because you’re a truth-teller, an industry shaker-upper, or just a downright character people want more from (and can’t wait to buy from). An attention-grabbing idea, point of view, or personal philosophy that's totally unique to YOU -- and makes you and your brand impossible to ignore. 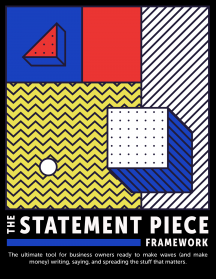 Use the framework’s three “Statement Piece Scenarios” to uncover an opinion, point of view or philosophy you’re itching to share, or wish more people understood. Struggle to articulate your ideas? You’ll get prompts to give form and shape to your concepts, and make them coherent, captivating, and oh-so-shareable. Finally: You post. You'll get examples of killer "statememt piece" brands to inspire you, and a list of places to share your opinion, so you can start sharing, and getting noticed. You won't just have a system for crafting and sharing meaningful, captivating content on the daily. You'll have the tools to do it over and over again. Ready to become unmissable in your industry by leaning into the way YOU see things? You don't need another template. You don't need another formula. You need to hone in on what you really think. Stop following everybody else's rules. "HAND IT OVER ALREADY, JEEZ!" Get genuinely pumped to blog, post, share, vlog, and livestream well and often -- because you can't wait to spit your truth every day. Competitors shmompetitors. When you're clear on your own point of view? You're irresistible to your ideal people by default. What do all your industry heroes have in common? A distinct way of seeing things that you absolutely love. Now, it's your turn to do the same. Sales copy that, uh, actually sells. Big. Becoming a voice your customers can't get enough of. ... And generally (finally) being seen as the kickass, free-thinking force that you are. Brooklyn-based entrepreneur Hillary Weiss types words into the internet and money comes out. And since 2011, she's helped hundreds of businesses of all sizes and stripes do the same. She's the creator of The Wordshops copywriting course, the copywriter, ghostwriter, speaker, and coach for hire over at HillaryWeiss.com, and the founder of Statement Piece Studio (coming Winter 2018). Hillary's been featured on Business Insider, The Next Web, The Observer, and more -- and specializes in helping brands find their voice, and get seen & heard with content that truly speaks their language, and fits their phenomenal work. Because words that lift hearts, ignite minds, and get results can do more than just change your business – they can change the world too. Wanna know more? Catch her riffs on creativity, cats, and the art of writing on her blog or Medium, or say whaddaaap! to her on Twitter @hcweiss. You wanna start writing, sharing, and saying the stuff that really means something? Drop your name + email below to get the PDF.